One of the greatest delights of parenting a 4-year old has been letting him independently browse in the Beachwood Branch of the Cuyahoga County Public Library. Children’s nonfiction is just two stacks away from some of the parenting titles, so I can do research for my blog snackdinner while he parks himself in outer space. Our recent expeditions to the stacks have produced some great reads, including Kate Davies and design-duo Carnovsky’s Illumanatomy and Jenny Broom and Kristjana Williams’ gorgeously illustrated The Wonder Garden. (I guess kiddo wandered out of outer space). Like any treasure hunt, browsing the stacks can also turn up duds. I find this is especially true in children’s fiction, because for every wonderfully imaginative book, there’s an “I Can Read” book with a 32-page movie summary. I don’t want to dampen my son’s enthusiasm for reading, so I haven’t yet told him that just because you can read something doesn’t mean you should. Here’s what I do to find well-written, delightfully-illustrated, happy-to-read-100-times children’s fiction. Your kid can’t have a favorite author if she doesn’t know any authors’ names. And yet, when eager to get through bedtime, we may feel tempted to skip to the story and leave authors and illustrators out of it. Once you’ve read the bios, check out the acknowledgments. Reading the acknowledgments will give your kids some early lessons in attribution and gratitude, and will often reveal new authors, as friends like to mention their friends, and many authors have author friends. Chris Harris doesn’t mention any writer friends in his acknowledgments for I’m Just No Good at Rhyming, arranged by “level of gratitude,” but those acknowledgments can help your kids see all of the background work that went into creating a book. Harris also thanks “the guy who told me this book would never sell. (It kind of motivated me).” That’s a great argument for following your dreams because Harris bumped Where the Sidewalk Ends down to my number two favorite book of children’s poetry. Did you love Exclamation Mark, the story of punctuation learning to make its mark on the world? Search for Amy Krouse Rosenthal on Amazon or your library’s catalog to find dozens of new favorite books. Seriously, dozens. Krouse Rosenthal, like many children’s authors, was astoundingly prolific. You may also find a few treats for yourself this way. Krouse Rosenthal wrote books for grown-ups as playful and thought-provoking as her children’s work. Judith Viorst is best-known for bringing us Alexander and the Terrible, Horrible, No Good, Very Bad Day, but also collections of poetry and prose about marriage and aging. Many children’s authors have vibrant social media presences, some of them even in-character. Mo Willems’ pigeon, for example, is an enthusiastic tweeter, and can introduce you to new authors as well as great family activities like doodle dinners. Willems runs a fan’s dream of a website, with loads of activity sheets, games, and in-world material for his most beloved characters. Once you’ve exhausted your favorite authors’ backlists and websites, use what you like to find more things you like. Help your child search their current favorites on Amazon, then scroll to “customers also bought” for related suggestions. If your child loved Dan Santat’s expansion of Humpty Dumpty in After the Fall, for example, an Amazon search can lead you to Jory John and Ross Burach. If you read all 25 Elephant & Piggie books and still want more, there’s the “Elephant & Piggie Love Reading” series, in which those familiar characters introduce new authors they like reading. You can leave Amazon out of this and go analog, too. Just have your child find the children’s librarian and ask what to read next. 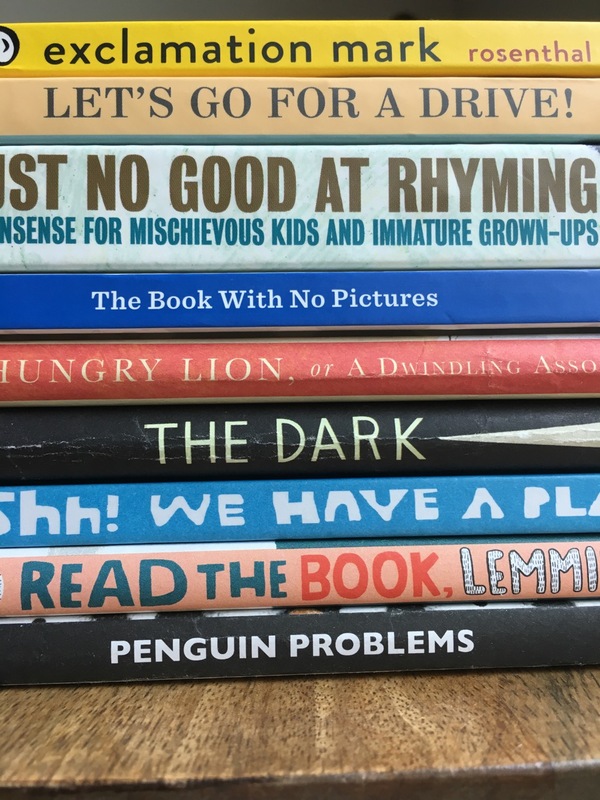 If I see a little pair of eyeglasses on a book spine, I don’t even have to open the book to know I want to read it, because Chronicle Books’ list of quirky children’s titles never disappoints. (Highlights include Kelli Anderson’s This Book is a Planetarium and all of the titles in 826 Valencia’s 642 Things series.) Chronicle is also the maker of some of my favorite adult books in kid wrappers (Avery Monsen and Jory John’s All My Friends are Dead, Jill Twiss’ A Day in the Life of Marlon Bundo). It’s easy to identify the publisher. Most of the time you can get that information from the spine, but if not, just look at the copyright page, which will contain the publisher information. In children’s literature, the copyright page often rewards readers with additional detail. The copyright page for I’m Just No Good at Rhyming (a repeat recommendation here because it is just that good) includes an “apology” that makes the poem on page 105 even funnier. You can search for publishers’ websites to identify other possible titles, or send your kids on a hunt to find the publishers’ logo on spines in the children’s section of the library. Your young readers probably aren’t online yet, but you are! Enlist a few parents to jot down their children’s favorite books and swap lists with each other. And if you liked the books I recommended above, send me some book suggestions! I promise to respond with at least five more book recommendations for your kiddos.